ERASER: “Erase" (don’t sing) the words “choose” and “right” in the song Choose the Right. GLUE: Glue your legs together and your arms to your sides so you hold really still while we sing When He Comes Again. MARKERS: Only sing I'm Trying to Be Like Jesus when you are wearing the same color as the marker that is held up. RULER: Measure the volume as we sing Every Star is Different. Point to 1 inch for softer up to 12 inches for louder. CALCULATOR: Count how many times we sing the words "be true" and then “dare” in the song Stand for the Right/Dare to Do Right Medley. PENCIL: Write with your hands (sign language) to the song As a Child of God. SCISSORS: "Cut" the song When I am Baptized by singing it staccato (choppy). SHARPENER: Sharpen the song by enunciating each word for Nephi's Courage. 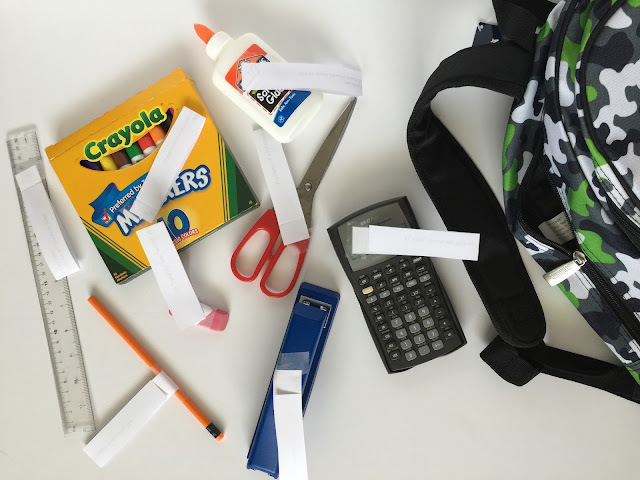 Before primary, hide the 8 objects around the room, placing the empty back pack up front. Or an alternative is to simply have good singers come up and pick an item out of the back pack.